The Steam Cloud Balloon was a hot-air balloon which can disguise itself as a cloud thanks to a special steam machine that Luigi installs in it. 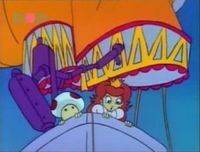 The Steam Cloud Balloon only appears in The Adventures of Super Mario Bros. 3 episode "Mind Your Mummy Mommy, Mario". Needing a way to approach Castle Koopa unnoticed, Raccoon Luigi tows the Steam Cloud Balloon through Dark Land towards the castle, while Princess Toadstool and Toad ride in it. The Steam Cloud Balloon is destroyed when it gets sucked up by a Mushroom Kingdom Twister, and is hurled into a tower of the castle. This is a huge loss on the group's part, as they had been planning to use the balloon to escape from the castle with Prince Mushroomkhamen's stolen mummy case. Although the Steam Cloud Balloon cannot be rebuilt, Luigi succeeds in reusing the broken parts to construct his own Steam-Powered Mummy Sled, which he, Princess Toadstool and Toad ride on with the mummy case to escape from Castle Koopa. This page was last edited on August 17, 2018, at 22:52.